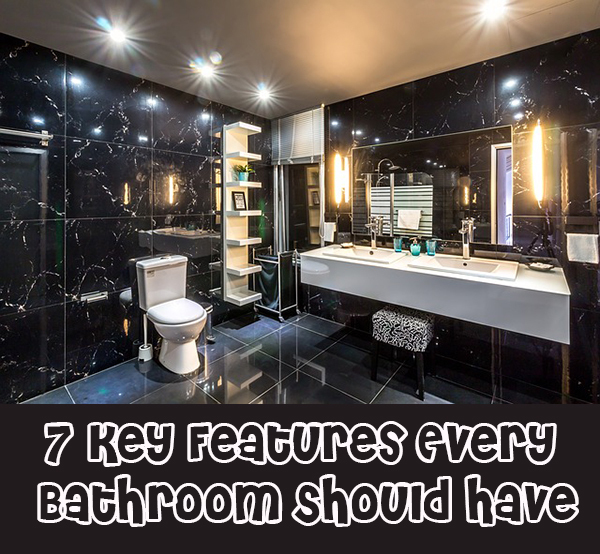 Similarly, a bathroom won’t be complete without these key features. Light emitting diode or LED lamps are not only kinder to your budget, but they’re also better for the environment. Although LED bulbs are more expensive than traditional incandescent lights, they are more economical because use about 75 percent less energy and last 25 times longer than traditional incandescent lights do. Ninety percent of the energy used by an incandescent light bulb is released as heat, wasting a ton of energy. Compact fluorescent lights, or CFLs, aren’t any better. Although they consume significantly less energy than incandescent lights do. CFLs still waste 80 percent of the energy they use in releasing heat. LED lights produce a scant amount of heat, making them more energy-efficient. In the bathroom, where good lighting is essential, LED lamps discharge light in a straight direction. This is ideal to use for recessed and pendant lighting in the bathroom. The trend right now when it comes to key bathroom features emphasizes efficiency and conservation. It’s no longer just about design or aesthetics. With the double threats of global warming and climate change, building a green home is practically a necessity. As the area in the house where you use the most water, the bathroom should be equipped with a water-efficient shower, faucet, and toilet. Old fixtures use excessive amounts of water. Compared to a water-efficient toilet, an old model uses about 2 to 6 more gallons of water for a single flush. Inefficient showerheads and faucets aren’t any better. A standard showerhead spouts 2.5 to 4.0 gallons per minute while a water-saving type only uses about 1.5 to 2.0 gallons every minute. And if you switch your faucet aerators to low-flow ones, you can save as much as 2.0 gallons of water per minute. A damp space is the perfect environment for mold and mildew to develop, and the bathroom has plenty of moisture to feed these fungi. That’s why every bathroom needs a ventilator or exhaust fan. It the room faster, preventing the growth of mold and mildew. But even without both, exposure to damp environments can be detrimental to people’s health, especially those who have allergies, asthma, and existing lung conditions, so it’s always important to maintain keep your bathroom and the rest of your home sufficiently dry. If you already have an exhaust fan, consider switching to an energy-efficient unit. Most residential ventilators don’t consume a lot of energy, but efficient modern models use even less while providing better performance. You can look for an exhaust fan with the Energy Star sticker on it. Although one may cost more than a standard ventilator does, you’ll get more value out of your money with its efficiency and superior quality and performance. Tissues, sanitary pads, and solid wastes tend to clog the drain when you flush them down the toilet. A simple clog can be fixed with the use of a plunger or of clog-busting products. However, if you use your toilet as if it were a trash can, you’ll eventually encounter a problem that’s more than a plunger can handle. A toilet clog is one of your worst nightmares as a homeowner. For one, it can create a lot of mess and stink up your bathroom (or entire home if it’s dire enough). Fortunately, there’s one key bathroom fixture you can install to prevent this nightmare—a toilet with a built-in grinding motor. Also known as macerating toilets, these fixtures have a powerful motor grinder connected to the drain to break down solid waste you flush down the toilet. Consider switching out your old toilet for one like the Saniflo upflush toilet with a macerating pump. The upflush system allows you to link multiple fixtures, like the tub and sink, to the macerator and connect to your home’s existing sewage system or septic tank all without digging a hole underneath your flooring. Wall mirrors, especially in the bathroom, don’t go out of trend no matter the year. Mirrors are essentials that perfectly blend form and function, meaning they add both aesthetic and practical value to any space. With a huge mirror, it’s easier to do your morning ritual and grooming routine—shaving, brushing your teeth, applying makeup. Installing a wall mirror can also instantly transform a space to make it bigger and brighter. It’s practically a necessary feature for tiny bathrooms. Timeless and versatile, a wall mirror is a perfect bathroom accessory whatever the style of your interior. It can be sleek and simple for a modern or minimalist look or framed and fancy for a spa-like feel. Damp tiles can be slippery. If you’re not careful, you can slip and injure yourself. Prevent accidents in the bathroom by placing nonslip mats on your bathroom floor, shower, and tub. Bath mats come in different shapes, sizes, colors, and materials. If you hate the shock of stepping on a cold floor, put a plush rug by the bathroom entrance to prep your feet. This type of rug is made from fabric, so you should avoid getting it wet. Waterproof mats are more suitable to place in the shower or bath since they have more hold and are more durable despite getting wet multiple times. Whether it’s for privacy, security, or preference, some people don’t like putting windows on their bathroom. But windows are exactly what every bathroom needs. For one, it provides more ventilation, which, as mentioned earlier, is vital for a clean and safe bathroom environment. Having a window also means that you can let in more natural light in your bathroom. In the day, you don’t need to turn on the electric lights to navigate around the bathroom. Furthermore, sunlight doesn’t just make your bathroom look Instagram-worthy, but it also helps sanitize it. Direct exposure to the sun’s rays can kills germs and bacteria, sanitizing your bathroom naturally. As one of the essential spaces in a home, the bathroom should be equipped with complete amenities and features. These inclusions make your daily routine easier. Be they energy-saving appliances, water-efficient fixtures, or essential accessories, each and every feature adds value to your bathroom. And with the numerous environmental crises the world is facing now, the least every homeowner can do are to choose eco-friendly products in their homes, have a sustainable means of living, and to change wasteful habits. You can start by choosing energy- and water-efficient appliances and fixtures in your bathroom, as well as practicing sustainable lifestyle choices.